Little Traveler is a holo top coat. I layered 1 coat over Elevation Polish Mount Agepsta with no top coat. Sample LSA #21 has scattered holographic with blue and pink flakies in a blue jelly base. For these photos I layered 1 coat over Sally Hansen Lick-O-Rich on all nails except my ring nail. My ring nail is 3 coats of Sample LSA #21 over bare nail. All nails have a top coat. There is Gold In These Mountains is described as a light to medium grey polish with sprinkles of multi colored shimmer (blue, green, purple, little bit of red, hint of copper) with intense gold flake shimmer and Real gold mini nuggets. All nails are 2 coats with no top coat. All the polishes featured are prototypes and/or specially made and cannot be remade, sorry!. 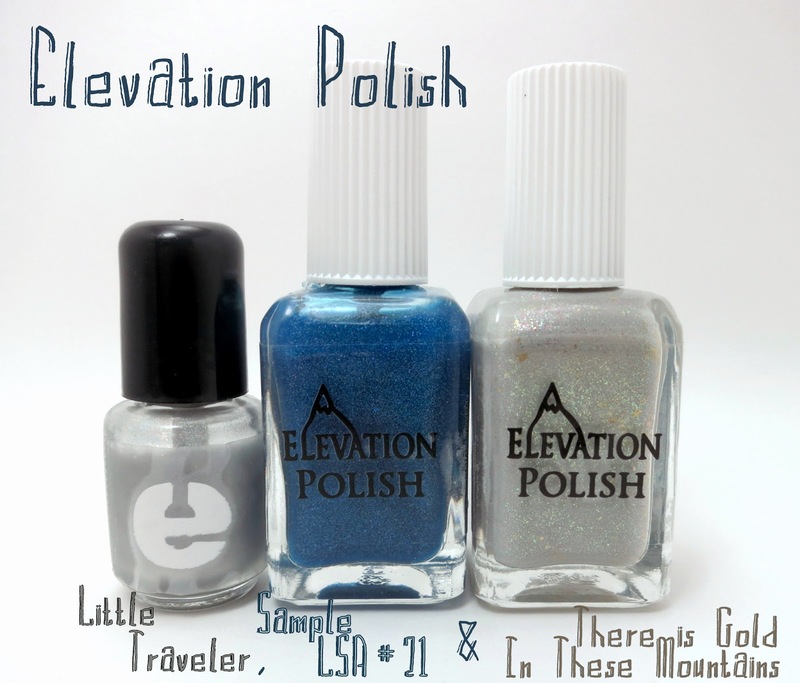 You can still find other great polishes from Elevation Polish in her BigCartel store. It is stocked every 7th (at 9 PM CST) and 22nd (at 9 AM CST). Find information about restocks and new colors on Lulu's blog.